There’s a chill in the air and pumpkin spice in every latte – fall is officially upon us! Which means that holiday season will soon be here. 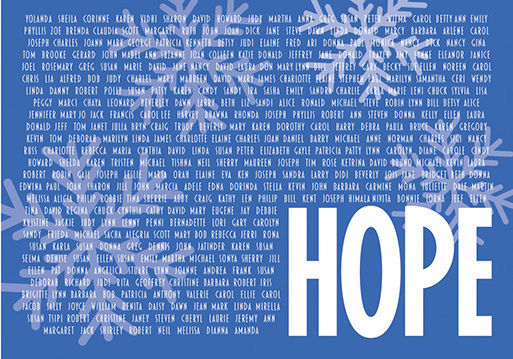 This year , Cancer Hope Network is proud to offer holiday cards for purchase. The cover design features the name of each of our Support Volunteers, as well as a brief description of the CHN mission on the back. They’re an opportunity to spread holiday cheer and share your CHN pride while supporting our work. Sets of 10 cards are available for a donation of $20. For more information, or to purchase your own set(s), please contact Sarah Cassidy – 800.552.4366 ext 20. or scassidy@cancerhopenetwork.org.